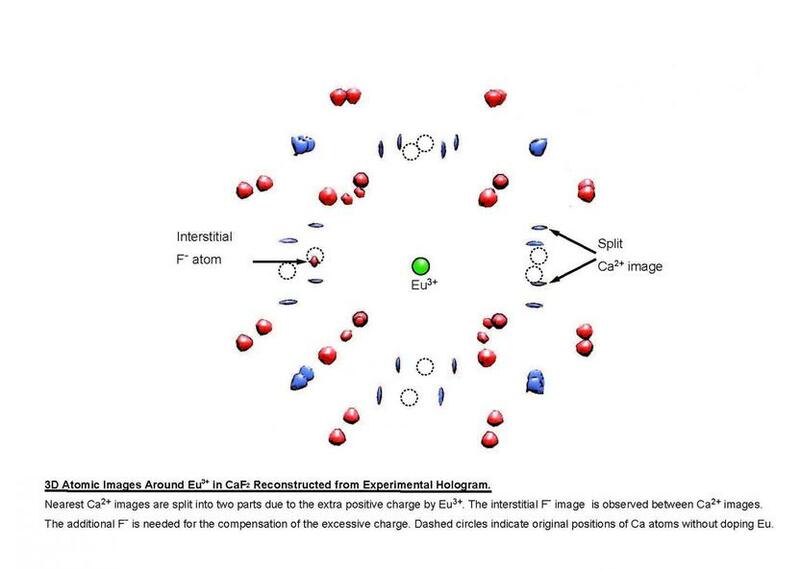 Nearest Ca2+ images are split into two parts due to the extra positive charge by Eu3+. The interstitial F- image is observed between Ca2+ images. The additional F- is needed for the compensation of the excessive charge. 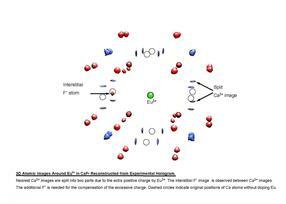 Dashed circles indicate original positions of Ca atoms without doping Eu. People usually associate holograms with futuristic 3D display technologies, but in reality, holographic technologies are now being used to help study materials at the atomic level. X-rays, a high energy form of light, are often used to study atomic structure. However, X-rays are only sensitive to the number of electrons associated with an atom. This limits the use of X-rays for studying materials made up of lighter elements. Neutron measurements can often fill in the gaps in structures when X-ray measurements fail, but neutron beams are harder to make and have lower intensities than X-ray beams, which limits their versatility.